PHUKET: -- Although the adverse weather is not thought to have directly caused either accident, it may well have been a factor in at least one of the two accidents that occurred along Phuket’s notorious Thepkrasattri Road yesterday. The first incident, shortly after midnight, involved a modified Isuzu D-Max pickup which struck an electricity pole on Thepkrasattri Road in the vicinity of the Tesco Lotus shopping center in Thalang. Kusoldharm Rescue Foundation workers and Baan Nai Khlam volunteers attended the scene. 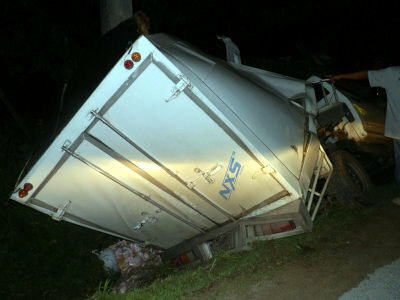 However, with the exception of a spilled load of frozen chickens, there were no injuries. One of the rescue workers at the scene reported that the driver had fallen asleep at the wheel while driving the Surat Thani-registered vehicle. The second accident occurred about 23 hours later, when at 11:15pm, Thalang Police Duty Officer Patiwat Yodkwan was informed of an accident on Thepkrasattri Road, north of Thalang Town. Police, Kusoldharm Rescue Foundation workers and Baan Nai Khlam volunteers were dispatched to the scene, where they found a white Toyota Hilux pickup truck with its hood ripped off by low-hanging telephone wires. Capt Patiwat explained that the Hilux was being driven by Sanga Kalasang from Phang Nga, who had travelled with his wife to collect his two-month-old niece. Mr Sanga told officers that he saw the low cables too late to avoid driving into them. 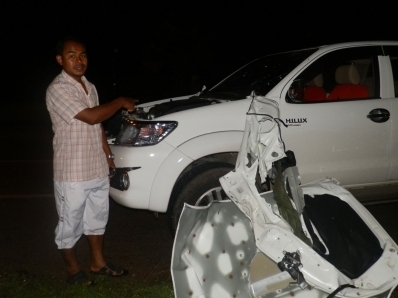 “It was fortunate that Mr Sanga was able to control the vehicle and no passengers were injured,” said Capt Patiwat. Damage was confined to the vehicle, which had its hood ripped off, a smashed windscreen and damaged wing mirrors, and a section of telephone cable which had been brought down and was lying across the road.